An expert team of Lawyers have begun a leading compensation company named No Win No Fee Expert Solicitors, in 2012, with the aim of helping people to claim compensation through an online process. Through this online approach, No Win No Fee Expert Solicitors is able to provide hassle-free and jargon-free information, advice, and services, thus allowing even ordinary people the peace of mind that this team of top UK Lawyers will work on their behalf. This company is dedicated to working hard to claim settlements and providing the correct outcome that you are entitled to. 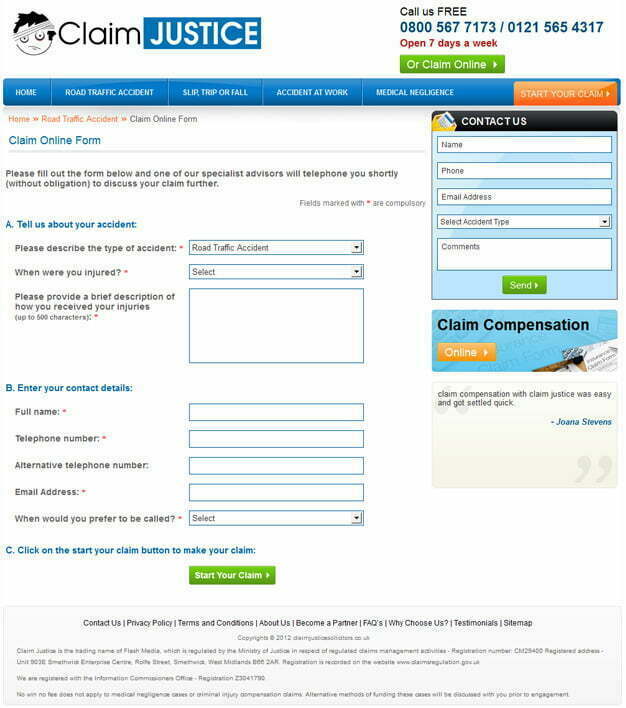 www.claimjusticesolicitors.co.uk maintains a high level of customer service as well as a philosophy of real advice. They are committed to keeping interactions with customers to the highest possible level through offering continual training programs and monitoring all claim handlers. Through this they ensure that those who wish to claim compensation may do so with the best possible advice and help. As an extremely customer service driven company, No Win No Fee Expert Solicitors needed a website that could present their services in a professional and comprehensive way. Through this website, potential clients had to be able to easily understand details regarding the company, the services offered, and the process for stating claims and receiving the necessary help. The design and layout of the website needed to be attractive yet highly informative as well. Pulse Solutions was able to fulfil all of these requirements and more! With a creation that was built using .Net/SQL, Pulse Solutions designed a website that allows easy user navigation through a simple and comprehensive layout. Information on the website was presented in a well structured manner allowing the user to understand at a glance how to contact the company and submit a claim compensation. The website was an overall success, as through it, potential clients are able to feel more confident in seeking advice on compensation knowing that they will get the assistance they need.